Are you looking for a complete ALEKO AC1400 sliding gate opener review to help you decide whether to purchase it for your commercial sized gate? Too much and too little information makes it difficult to decide and so we tried to help by creating a review that is sourced from product information, features, pros and cons, and user experiences with the product. Hopefully, this information will help you when it comes time to shop for a sliding gate opener. If you have a large gate that is not only long but also heavy, you need a reliable gate opener that is able to easily maneuver it. The ALEKO AC1400 sliding gate opener is designed for long and heavy gates. The ALEKO company was established in 2005 and they are based in Seattle, Washington. Even if they are fairly new in the industry, they produce many different products specially made for automating gates. The ALEKO AC1400 sliding gate opener is a good product for its price but you have to be knowledgeable about electric and mechanical things to install it. Once it is properly installed, it works as it claims, but you might want to paint the base to prolong its life and prevent rust. Who should buy this gate opener? The power that this gate has is suitable for those who have larger gates that have a length of up to 50’ and a weight of up to 1400 lbs. Are you tired of waiting for a long time before the gate opens enough for your vehicle to pass through? Do you find it impossible to find gate openers that opens the gate at a faster speed? The ALEKO AC1400 sliding gate opener may not be a fast gate opener, but you can use the remote to command it to open from 150’ away. This helps lessen the time you have to sit and wait before the gate fully opens. Do you have a gate that is up to 50’ long and 1,400 lbs. in weight? Are you afraid that gate openers can fail and cause your gate to crash? The 1.5-HP motor found on this gate openers allows it to have enough power to move the gate smoothly and effectively. This smooth motion makes most users feel secure that the gate opener won’t fail. Do you need your gates closed but still accessible to multiple users? The ALEKO AC1400 can be paired with many different remote controls so that you can have one for each vehicle that regularly passes through your gate. This provides a more convenient yet secure way to give access to your gate. Just make sure you follow the instructions on how to connect the remote control to the gate opener for it to work. The ALEKO AC1400 sliding gate opener is readily available on Amazon and comes with a limited 1-year warranty. It is packed in an 18.4” x 17.6” x 10.7” box and weighs 27 lbs. The purchase includes everything you need to make it work and all you have to do is to install it properly. 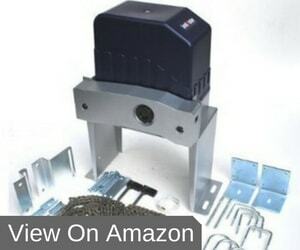 As you can see from this ALEKO AC1400 sliding gate opener review, there are good and bad things about this gate opener. Nevertheless, we still recommend it to people who have a large gate that needs a gate opener with a strong motor. Although you may need to have it installed by a professional, and also paint the base, it is still worth the price that you pay for it.